Coordinators: Bayse Craig A., Brumaghim Julia L.
Biochalcogen Chemistry: The Biological Chemistry of Sulfur, Selenium, and Tellurium highlights the biological uses of heavy chalcogens as a key area of focus in bioinorganic chemistry and a unifying theme for research in a wide variety of disciplines. Recent achievements in these multidisciplinary efforts are presented that discuss the subtle, yet important roles of biochalcogens in living systems as sulfur- and selenium-containing metabolic intermediates and products (Chapters 1 and 10) and in their oxidation when coordinated to metals (Chapters 3 and 4). Chemical and instrumental tools for detecting sulfur and selenium species and their functionalities are also discussed (Chapters 2 and 6), as are new directions in biochalcogen applications to redox scavenging, both in terms of synthesis (Chapters 7 and 8) and mechanistic modeling (Chapter 9). 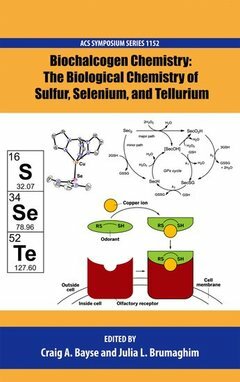 Tellurium, with no natural biological function, is represented together with sulfur and selenium as a phasing agent in nucleic acid crystallography and for other biological studies (Chapter 5). This book will serve as a useful collection of reviews and research results in this diverse field, encompassing research in bioinorganic chemistry, organic synthesis, computational approaches, and biochemistry, as an inspiration for researchers wishing to enter the variety of fields that encompass these multidisciplinary research efforts, and as a useful resource for undergraduate or graduate courses focusing on main group and transition element biochemistry. A wide audience will find this book a helpful resource for this rapidly expanding field. Craig A. Bayse received his B.S. in chemistry from Roanoke College in 1994 and his Ph.D. at Texas A&M University in 1998, working with Michael B. Hall on theoretical studies of the structure and bonding of transition metal hydride complexes. As a graduate student, he attended the European Summer School in Quantum Chemistry in Sweden and the Sostrup Summer School on Quantum Chemistry and Molecular Properties in Denmark. He took a brief hiatus from computational chemistry during a Kodak-funded postdoctoral appointment at Cornell University with Barry K. Carpenter, synthesizing novel azoalkanes. More recently, he added molecular dynamics simulations of proteins to his repertoire through a sabbatical appointment at the University of Florida with Kennie M. Merz. His research uses an amalgam of these computational and experimental approaches to explore the bonding and reactivity of inorganic systems. Julia L. Brumaghim received her Ph.D. degree from the University of Illinois at Urbana-Champaign and completed postdoctoral research at the University of California at Berkeley in both Bioinorganic Chemistry and Cellular and Molecular Biology. She is currently an Associate Professor in the Department of Chemistry at Clemson University in Clemson, SC. Recent work primarily focuses on metalmediated oxidative DNA damage and the mechanisms by which sulfur, selenium, and polyphenolic antioxidant compounds prevent this damage.